Low carb, no sugar treats that taste just like chocolate cake. Preheat oven to 350 °F (175 °C). Spray muffin tin pan with non-stick spray and set aside. Whisk together egg whites, almond butter and almond milk in a mixing bowl until smooth. Add the remainder of the ingredients to the mixing bowl and stir until well combined. Evenly spoon batter into muffin tins making 15 mini muffins total. Bake in oven for 10 minutes and enjoy. 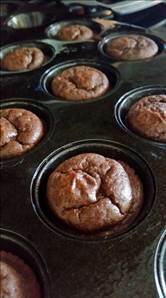 There are 31 calories in 1 serving of Mini Chocolate Protein Muffins. Calorie split: 41% fat, 27% carbs, 32% protein. Low carb chocolate cookies for Atkins or ketogenic diets. If you have leftover bananas this is the perfect recipe. Indulge in this scrumptious treat and still stay on track to your fitness goals. Helps keep those cravings in check. Taste like regular muffins and are yummy. A delicious low fat muffin recipe. Great for breakfast or an anytime snack.